Every major film festival feeds a little off the last. While programmers hope to find the next premiere that audiences won't stop talking about, they are also happy to host films that have already earned buzz. This year's SXSW included Sundance favorites "Sing Street," "Hunt for the Wilderpeople," "Under the Shadow" and "Morris from America." It was a great time for Austinites and its visitors to play catch up on some of Sundance's finest offerings, but it was an even better time for those who took risks on debuts, sometimes getting the opportunity to start the buzz themselves. Comedian Mike Birbiglia found Sundance success in 2012 with his writing/directing debut, "Sleepwalk with Me," his account of life on the road as a stand-up. Now he turns a similarly knowing eye to the world of improv theatre in "Don't Think Twice" [pictured above]. A troupe known as "The Commune" (including Birbiglia, Gillian Jacobs, Kate Micucci, Chris Gethard and Tami Sagher) are a makeshift family on the New York scene, doing comedy for small audiences and even less money. The dream of potentially being discovered by the thinly-veiled “Weekend Live” looms over every performer like a minor league ballplayer grinding it out in hopes of making "the show." When one of them (Keegan-Michael Key) actually scores an audition, it begins to slowly accelerate each of their desires to do what they love full-time so they can ditch their day jobs. Birbiglia's film distinguishes itself from the countless indies that treat improv as a quirky character trait or a joyous hobby. He understands that while there is an undeniable love of the medium, it can still be a profession filled with a lot of mediocre talent who either are never going to be marked for stardom nor necessarily should they be. It provides the film with an underlying and welcome sadness in-between the laughs, with Key and Jacobs giving particularly poignant performances. As Second City legend Del Close is mentioned more than once in Birbiglia’s film, it’s the Chicago-based Neo Futurists who play a supporting role in Logan Kibens’ "Operator" [pictured above]. Martin Starr plays a tech designer tasked with turning a computerized answering service for a health care provider into a more empathetic device designed to help customers rather than frustrate them. 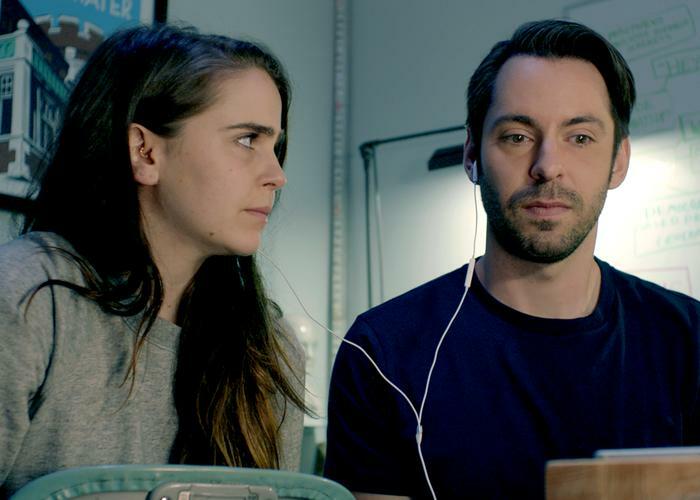 He finds the voice in his wife Emily (Mae Whitman), whose soothing demeanor in fielding customer complaints at her hotel desk job, as well as during her husband’s panic attacks, is the perfect construct. Perhaps too perfect. As their time begins to split thanks to work, his ailing mother (Christine Lahti) and her newfound freedom of expression as a part of the Neo Futurists, it is the now-electronic voice that could be the only part of their relationship that endures. The screenplay by Kibens and Sharon Greene has echoes of Spike Jonze’s Oscar-winning script for “Her,” but that’s certainly good company to keep. “Operator” begins as a very funny, very Chicago comedy, but its two lead performances (including the best work of Whitman's career) carry the film to uncommon insight into how we relate, emote and will always need the spontaneity of the human experience. SXSW's Midnight selections rivaled the far-less-than-stellar choices of Sundance this year (with its own lackluster picks like "Pet," "Jack Goes Home" and "Johnny Frank Garrett's Last Word”), but there was an inspired choice that could have qualified but landed just outside the category. What begins as a horror film in Carson D. Mell's "Another Evil" [pictured above] quickly turns comedic. Steve Zissis (HBO’s “Togetherness”) stars as a family man who witnesses a horrific presence in his vacation home. An initial ghost hunter (hilariously played by Dan Bakkedahl of “Veep”) says there is probably nothing to worry about except maybe his xenophobic attitude towards the spirit world. Seeking another opinion, he brings in Mark Proksch (“Better Call Saul”), an "industrial grade exorcist" who wants to take time to do the job right, which means he’ll move into the home, thus forming a "Cable Guy"-like dynamic that makes one wonder who or what the ultimate threat is. Mell's script does a terrific job of keeping the plot off-kilter between comedy and horror. It is certainly two-thirds in favor of the latter, but even as it reaches its climax it is left to each viewer whether they should be laughing or horrified at the antagonist's initiative. Or is he the protagonist? That's just part of the fun of this often hilarious oddity. For true horror fans though, the best of SXSW's Midnight premieres was Fede Alvarez's "Don't Breathe." Back in 2013, Alvarez made a name for himself by easing the minds of genre purists that his remake of Sam Raimi's indie classic "Evil Dead" would be high on practical effects and an abundance of gore. Results were mixed between those who loved it and those who felt it missed the mark on actual terror, but if "Evil Dead" was just a little taste of Alvarez's talent and affection for horror, his latest is certainly more of a meal. A trio of young Detroiters (Dylan Minnette, Daniel Zovatto and “Evil Dead”'s Jane Levy) plot a burglary of a blind man (Stephen Lang) in a near-abandoned part of town. It sounds like a no-brainer of rooting interest, but as the film progresses—like with "Another Evil"—viewer loyalty is tested as the tables are quickly turned on the aggressors. The revelations reach an almost inescapable feeling of disbelief, but Alvarez's skill then takes over and he viscerally takes us on a ride of claustrophobic escapes and bits of thrilling inspiration lacking in most films of its type. With shades of "Panic Room" and "You're Next," "Don't Breathe" is in line to become a new horror fan favorite and a title that future efforts will be compared to in their own right. One of the truly great and unexpected discoveries of this year's SXSW was Joey Klein's "The Other Half" [pictured above]. Tom Cullen ("Weekend," "Downton Abbey") plays Nickie, a cab driver with a short fuse still grieving over a family tragedy. He meets his opposite in Emily (“Orphan Black”'s Tatiana Maslany), who is very up with life and makes him smile in a way that has likely been absent the past five years. The more open Emily is to this new relationship though, the more the symptoms of her bipolar disorder come to the forefront. Thinking of Emily as just another free spirit manifested to bring an emotionally-deadened male back to life is enough to give pause to this experience. Throw on top of all that the recent abundance of films involving people with Autism and those afflicted with ALS taking road trips to find romance, and Indie Movie Warning Bells are probably going off. Luckily, “The Other Half” handles its material with grace and authenticity. Klein is not interested in exploring mental illness as a cutesy crutch that needs to be overcome for a happy ending. What Emily lives with is shown as difficult, and the film never shies away from how that difficulty can affect even someone who loves her deeply. It is almost improper to suggest that the star of “Orphan Black” would be an ideal candidate to play a bipolar character, but Maslany is one of the most interesting actresses working today and she does not treat the symptomatic Emily as separate personalities but rather an individual struggling to maintain the best parts of her. Cullen is every bit her equal, projecting a screen presence that is equally confident and mysterious by using very few words to reflect his state of being. Klein has a visual language that recalls the early work of David Gordon Green (particularly his "All the Real Girls") and announces himself as a real talent to watch as he navigates what could have been stale, borderline offensive material into something memorable and heartfelt.